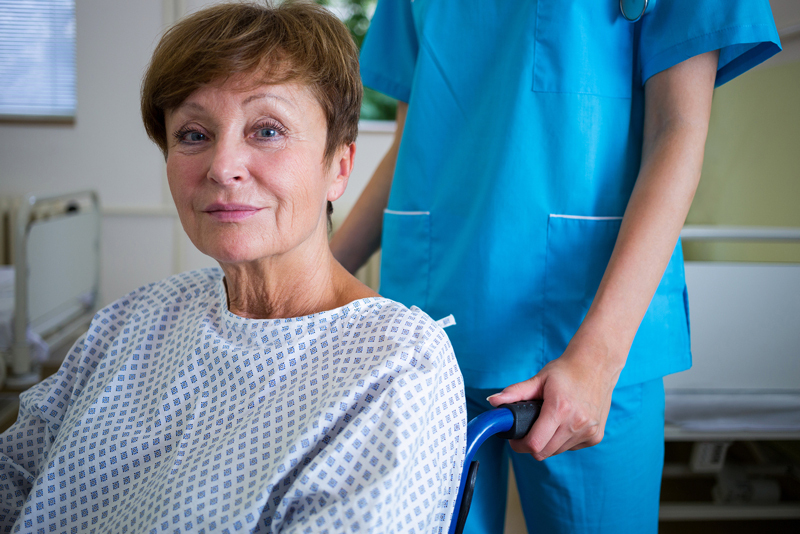 What is a total knee replacement, what should you expect and how will you recover? The first step when making the decision about knee replacement is to meet with your surgeon to see if you are a candidate for total knee replacement surgery. Your surgeon will take your medical history, perform a physical examination, and X-ray your knee. Even if the pain is significant, and the X-rays show advanced arthritis of the joint, the first line of treatment is nearly always non-operative. This includes weight loss if appropriate, an exercise regimen, medication, injections, or bracing. If the symptoms persist despite these measures, then you could consider surgery. PATIENT TESTIMONIAL FOR TOTAL KNEE REPLACEMENT – MEET DAVE VASILATOS. The knee joint is one of the strongest, most important and most complex joints in the human body. It allows the lower leg to move relative to the thigh while supporting the body’s weight. Movement, strength, and stability at the knee joint are essential to many everyday activities, including walking, stair climbing, sitting and standing. The thigh bone (femur) meets the large shin bone (tibia) to form the main knee joint. This joint has an inner (medial) and an outer (lateral) compartment. The kneecap (patella) joins the femur to form a third compartment, called the patellofemoral joint. The patella sits on the front end of the femur bone and functions to connect the powerful quadricep muscle to the tibia bone. Arthritis is a common cause of severe knee pain and disability. 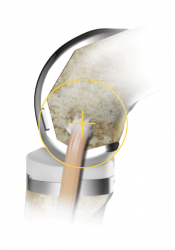 In a normal joint, there is a thick smooth perfectly formed cartilage coating over each of the bones which produce a pain-free, smooth, and highly functional bearing surface. Arthritis is the process of degeneration or loss of this cartilage coating of the bone ends producing partial if not complete bone-on-bone wear. This bone-on-bone wear is a source of significant pain, swelling, instability, stiffness, and weakness at the affected joint. These factors can produce significant functional disability resulting in a reduced quality of life and loss of independence. The three most common types of arthritis are osteoarthritis (the same as degenerative arthritis), posttraumatic arthritis, and rheumatoid arthritis. There are many other types of arthritis and many of them as they reach the end stages of joint destruction are managed much like osteoarthritis. The most common type of arthritis is osteoarthritis, which is a progressive wearing of the cartilage in the knee joint. It becomes symptomatic more frequently in individuals 50 and older. After 50, the impact of osteoarthritis can worsen due to accumulated use and the wearing down of cartilage that occurs with age. Osteoarthritis of the knee causes pain, limited range of motion, stiffness of the knee, swelling of the joint, tenderness, deformity and weakness. Patients with a family history osteoarthritis and obesity are at an increased risk of developing osteoarthritis. Rheumatoid arthritis is an autoimmune disease that causes the tissue around the joint to become inflamed and thickened. Chronic inflammation often leads to damage and loss of the cartilage that coats the ends of the bones. Rheumatoid arthritis represents only about 10 percent to 15 percent of all arthritis cases. Post-traumatic arthritis can result after a knee injury, including bone fractures, cartilage and ligament tears. Previous surgeries for such a condition including plate, screw, or rod treatment for fracture, ligament reconstructions, and meniscal or articular cartilage surgery can predispose a knee to develop posttraumatic arthritis. These injuries can damage the cartilage in your knee over time and lead to pain, swelling, and stiffness. During the total knee replacement procedure, thin wafers damaged bone and cartilage are removed at the joint surfaces and replaced with prosthetic components. The bone/cartilage wafer thicknesses are approximately ½ inch thick. Each of the approximately 10 bone cuts are planned with great precision with respect to their relative thicknesses and angles. This precision angle and thickness measurement process allows the surgeon to properly align the leg such that the prosthetic knee joint will fit and will function for a long time. The femur (thighbone) is measured with manual instruments or computer guidance and then precise cuts are made using special instruments. The damaged bone and cartilage are removed and the femur is then fitted with the first portion of the artificial knee (femoral component). The femoral component is entirely metal. The tibia (shinbone) is then prepared again by precision cutting the proper thickness and angle of bony wafer to accept the new tibial component. The undersurface of the kneecap (patella) is also prepared by removing an appropriately planned cartilage/bone wafer and a polyethylene surface will be cemented into place. This produces a smooth gliding motion against the appropriate portion of the femoral component. At this point trial(provisional) knee implants of the femoral component, tibial components and patella component are inserted to verify satisfactory fit, balance, and alignment. The provisional components are removed and the cut bone surfaces are prepared for acrylic cementation of the permanent prosthetic implants. The prosthetic implants are then cemented into place with a meticulous and regimented technique. The three components are then connected and checked for exact precision. At this point the surgeon verifies the alignment, and balance of the knee ligaments containing the new knee prosthesis. The surgeon ascertains the kneecap tracks normally through a full range of motion, that the leg is properly aligned in several planes, that the joint will fully and completely extend (straighten out) and that it flexes (bends) properly. Having done so the incision is sutured closed and the dressing is applied precision. Your surgeon will review your medical history, perform a thorough physical examination and take x-rays of your knee. Other imaging and laboratory testing may be required depending on your individual case. Even if your pain is significant, and the X-rays show advanced arthritis of the joint, the first line of treatment is nearly always non-operative options. This may include weight loss, an exercise regimen, medication, injections or activity modifications. If the symptoms persist despite these measures, and with corroborating X-rays, then you may consider surgery. The decision to proceed with a total knee replacement is typically yours and is based on the pain and disability from arthritis influencing your quality of life and daily activities. Patients who decide to proceed with surgery commonly report that their symptoms keep them from participating in activities that are important to them like walking, taking stairs, working, sleeping, shopping, gardening and sometimes dressing independently. Surgery is the next option when non-operative treatments have failed. Obesity – Being severely overweight can impact your healing negatively. We require that surgical patients have a BMI score of no more than 35 (Click here for additional information on body mass index and the weight loss diet). You will be given a prescription for pain medications before surgery – make sure someone can get it for you and stores it securely. Patient Champion – Make sure to bring your patient champion with you if at all possible. Templating / Sizing X-Rays – We will take general x-rays of your knee and using specialized software, develop provisional sizing for the replacement joint. Laboratory Screen – Blood work will be drawn or reviewed. Surgical Clearance – If needed, we will obtain or review a surgical clearance from your primary care physician and/or specialist (cardiologist, pulmonologist, neurologist, etc). Questions – Final questions and plans discussed with your surgeon. Pre-Surgery Testing – Additional blood will be drawn for labs and an EKG will be taken. Final Surgery Consult – final details will be discussed prior to surgery. We will explain what and when to stop taking medications at this point and which need to be continued. Prescription Drugs – Discontinuing prescriptions that “thin” the blood as directed by your physician(s), such as aspirin is necessary prior to surgery. Any Narcotic/Opioid medications must be stopped prior to surgery as well. Food/Drink – Patients must refrain from eating or drinking as directed at the pre-op appointment. Make sure that you are well nourished and hydrated in the days and weeks prior to surgery (Water, Gatorade, etc). Your surgeon will see you, answer any last questions and “sign your surgical site”. Physical therapist helps you to your feet to stand and walk. Begin post-op activities taught during the pre-op visit. Ability to get from the bed to the bathroom and back to the bed with or without a walker. Ability to walk 50 feet down the hall and back. You will be given specific DISCHARGE INSTRUCTIONS and AT HOME EXERCISES for your care/recovery after you leave the surgical facility. CLICK HERE TO VIEW THESE INSTRUCTIONS. STEP 7 Exercise Your QUADRICEP Muscles! All knee replacement patients want to recover and begin walking independently as soon as possible. Indeed that is the goal! Nevertheless to achieve that goal significant and intense exercise to help the quadricep (thigh muscle) fully recover is required. Typically there is significant weakness of the thigh muscle even before surgery. Additionally stretching and maintain your knee’s ability to fully straighten out (full and complete extension to 0°) is equally important. There are other exercises and goals to achieve while recovering from your knee replacement surgery but none more important than quadricep exercises and stretching into full knee extension. YOUR SURGEON WILL SEE YOU AT YOUR TWO WEEK APPOINTMENT. What I can expect of my knee after knee replacement surgery? You should expect a significant reduction in pain and an improvement in functionality for daily living activities. Everyone’s situation is unique and therefore results very. The knee replacement is made of artificial parts and cannot be expected to function and feel like the normal knee you had when you were 16! Depending on your Body Mass Index (BMI), you may be told that you need to reduce your weight prior to surgery. People with a BMI score of over 35 can have a much more difficult time healing and have an increased risk of complications. Falls resulting in catastrophic injury to the new and healing knee replacement. What are potential complications of a total knee replacement? Potential risks of knee replacement surgery include but are not limited to: Blood Clots, Blood Loss, Infection of the Joint Replacement, Leg Length Difference, Knee Implant Loosening, Fracture of the patient bone, Numbness around the incision site, nerve disfunction resulting in numbness and loss of control of the foot and/or ankle, Wound healing delay and/or wound separation. Your surgeon and the entire surgical team have worked diligently to put together a program that significantly reduces the risk of complications. Over the last few years the complication rates have definitely been reduced but the potential for complications still exist and have not been completely eliminated. How long will a new knee joint last? Knee replacements do wear and can eventually wear out. Unfortunately, an artificial knee is not as durable as your own natural knee. Because the knee replacement implants are made of metal and plastic, these materials do wear over time, similar to the treads on your car tires. Studies show that knee replacements can last more than 20 years. This is dependent on many factors. The activity level, weight and age of the patient can effect the longevity of the joint. One very large study found that 80% of knee replacements were functioning well after 15 years in the younger (less than 65) patients, and 94% of the older (over 65) patients. My friend’s knee replacement makes an occasional pop or click. Will my knee replacement do that? Total knee replacement implants normally make a slight snap or popping sound with certain activities or maneuvers. Typically this is painless and does not present any problem. You may have relatively mild to moderate pain following the procedure, or you may have a more difficult time than others. Everyone is unique and handles and perceives pain differently. Keep in mind that while pain management has greatly improved, a pain-free surgery is unlikely. You will want to take your pain medicines as directed by your surgeon. The instructions on the pill bottle describe the maximum dose and frequency of the prescribed pain medicine. It is preferable to reduce the amount of narcotic pills as much as possible and minimize the amount of narcotic/opioids taken. Typically, the incision will be about 6 to 8 inches long but depending on the surgical needs – it is what is done underneath the skin that counts not the length of the incision! Your surgeon will make the incision as large as it needs to be in order to perform an excellent surgery. Will my terrible bowed leg deformity effect my outcome? Bowed leg and knocked knee deformity are common in severe arthritis of the knee. Correcting the deformity at the time of surgery is typical and a routine part of knee replacement surgery. Severe angular deformities can make the surgical procedure more complex. Occasionally the routine physical therapy protocol is modified as a result of the more complex procedure. Additionally once the angular deformity is corrected the patient may perceive the corrected knee has produced a longer leg. This perceived leg length inequality typically improves over time or in certain situations is corrected once the opposite knee is corrected. Typically, regaining the ability to kneel can be expected following knee replacement surgery. Nevertheless, this is dependent upon the patient’s ability to kneel prior to surgery and the level of obesity, strength and general well-being. Specifically once completely healed the replaced knee is capable of being kneeled upon. Typically, a spinal block is used and is a very safe option. There are other options available as well depending on what is best for each patient. It varies. Some patients will go home the same day while others may need to stay a couple of days. This is highly dependent upon your condition before surgery, your age, and medical problems which can influence your recovery. A safe discharge plan will be arranged for you by our orthopaedic team. The majority of people who undergo total knee replacement are able to participate in a majority of their daily activities by six weeks. By three months, most people have regained much the endurance and strength lost around the time of surgery, and can participate in daily activities without restriction. While daily activities have resumed, it is important to avoid high impact activities to give you the best long-term outcome with your knee. You can expect the majority of your recovery to occur within the first 6-12 weeks following knee replacement surgery however you can also expect the new knee to continue to slowly improve with respect to warmth, swelling, strength, and function for up to a year following the knee replacement procedure. Yes. In contrast to hip replacement surgery, almost all knee replacement patients require formal physical therapy in order to maximize the results of the knee replacement surgery. Ideally, this is performed at an outpatient physical therapy facility close to your home following your discharge from the hospital. Typically this is 3 sessions a week for approximately 6-8 weeks. We used advanced water proof bandages so you typically can take a shower within 48-72 hours depending. The same day! Most people are walking with the assistance of a walker on the day of surgery with the physical therapist. Prompt walking has been shown to reduce the risk of post-operative blood clots and is an important part of your recovery. Within the first month or two after surgery, you may walk using a cane or no walking aids depending on your progress. Despite the rapid progression to moving without assistance, it is typically not recommended that you return to aggressive/sporting activities until the third month after surgery. Depending on which leg… the right knee would obviously take a little longer to properly use the brake and gas pedals. All patients have to be off narcotics and no longer depending on a walker before they are able to drive on their own. Most patients are driving at four to six weeks after surgery, and sometimes sooner if the operative leg is the left leg. Returning to work is highly dependent on your general health, activity level and the physical demands of your job. If you have a sedentary job, such as computer work, you can expect to return to work in two to three weeks. If you have a more demanding job that requires lifting, walking, or travel, you may need up to three months for full recovery. Very few. We advise against any extremes – no extreme positions or activities. No yoga or marathon running, etc. Usually patients with joint replacements will set off metal detectors. This should not be of great concern. It is reasonable for you to inform the TSA screening agent at the airport that you have had a joint replacement; however, you will still require screening and will need to follow the directions of the screening agent. There are millions of individuals with joint replacements, and screening protocols recognize that people who have had joint replacements may set off detectors. Joint replacement documentation is not required. The American Academy of Orthopedic Surgery (AAOS) and American Dental Association (ADA) have generally recommended short-term antibiotics prior to dental procedures (one dose one hour prior to dental procedure) for patients who have had joint replacements. This recommendation continues for up to two years after your joint replacement. Two or more years after the replacement, continued use of antibiotics prior to dental procedures is based on the discretion of the treating surgeon and the patient. Your surgeon will consider many factors including whether or not you are at increased risk of infection due to immune suppression (i.e. diabetic, transplant patients, and rheumatoid arthritis). The use of prophylactic antibiotics prior to dental cleanings and other invasive procedures remains controversial. Most orthopaedic surgeons now recommend lifetime prophylaxis. Patients should discuss whether or not they need antibiotics prior to dental or other invasive procedures with their treating orthopedic surgeon. It is important to follow up with your surgeon after your joint replacement. In most cases, joint replacements last for many years. The frequency of required follow up visits is dependent on many factors including the age of the patient, the demand levels placed on the joint, and the type of replacement. We will consider all these factors and tailor a follow-up schedule to meet your needs. In general, seeing your surgeon every three to five years is recommended. Yes. 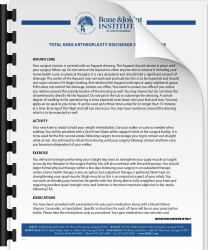 We have prepared a two-page document with instructions for your specific care after a total knee replacement.